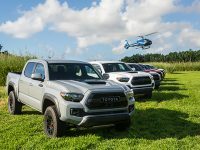 Post Tagged with: "toyota tacoma trd pro"
Today at the 2016 Chicago Auto Show, Toyota unveiled the latest edition of the Tacoma lineup, the TRD PRO. This truck takes off-roading to the next level with upgraded shocks, front lift, upgraded rear suspension and blacked out styling throughout. 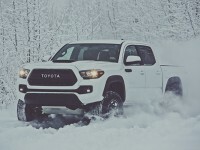 It raises the bar on off-roading yet again.